For more of my favorite soup recipes, pop over to my Pinterest page! Cook bacon in a soup pot until fat is rendered and bacon is cooked. Add ham to drippings and cook, stirring often, until lightly browned. Add potatoes, onion, celery, flour, salt, pepper and Cajun seasoning; toss. Add enough water to cover the potatoes and bring to a boil; reduce to a simmer, and cook, uncovered, stirring occasionally for 15 minutes. Add butter and milk and continue cooking another 10 to 15 minutes, or until potatoes are tender. Taste, adjust seasonings, and continue cooking on simmer, uncovered, until the soup reach desired consistency and thickness. Stir in cheese, just until melted. Garnish each serving with additional shredded cheese if desired and serve immediately. Cook's Notes: Can also use part or all chicken broth for the water. Looks like a very good soup Mary and I like mine with all of those ingredients - almost like clam chowder minus the clams. 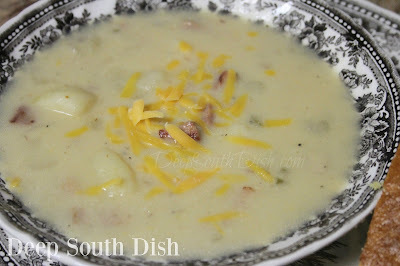 We're not too into clam chowder down here along the Gulf Coast - more like oyster stew I guess - which is similar. Maybe one of these days I'll make it somewhere to try some authentic clam chowder! So glad I discovered your site! I was looking at Museum of Appalachia store on facebook and saw your cookbook advertised, which led me to your blog! Love it and thanks for taking the time to share. The potato soup is a keeper! Thanks Susan and welcome to Deep South Dish! 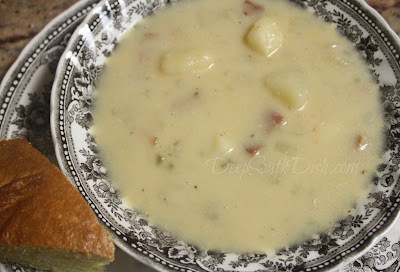 We tried this soup the other night and absolutely loved it! As a matter of fact, I just finished eating another bowl for lunch today. Will definitely make it again! Thanks so much for letting me know Judy!